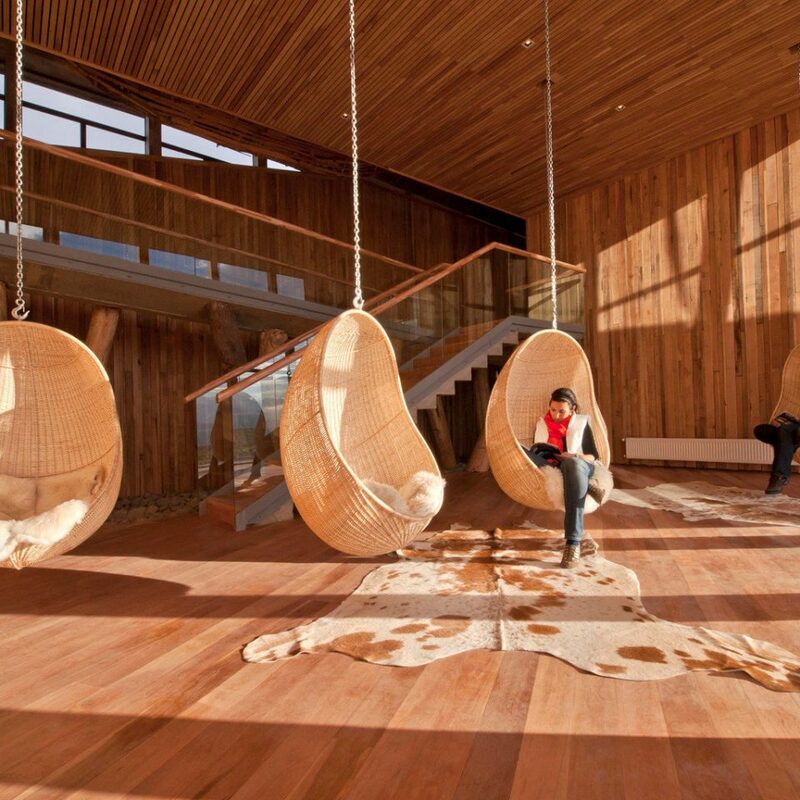 Designed by Chilean architect Cazu Zegers, the hotel on the eastern edge of Torres del Paine National Park brings the outdoors to your doorstep, and the undulating all-wood structure blends seamlessly into the rolling dales. 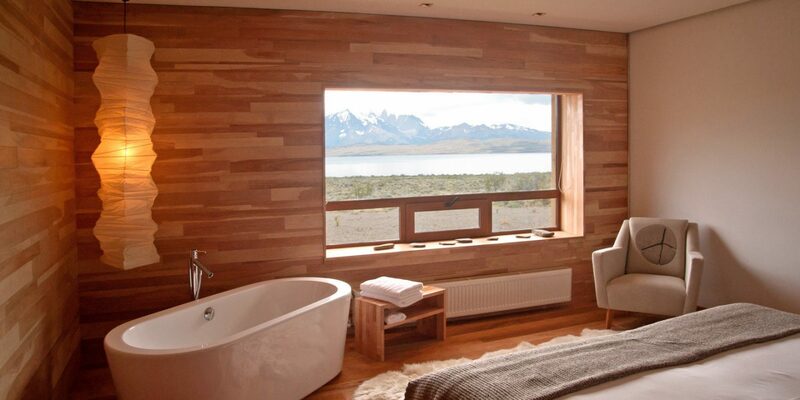 Stunning views can be had at every turn: Whether you’re sipping a Chilean Sauvignon Blanc at the open bar or relaxing on a sheepskin-covered bench in your guestroom, Tierra Patagonia, on the cusp of slate-blue Lake Sarmiento, always offers breathtaking views of the water and the Paine Massif in the distance. 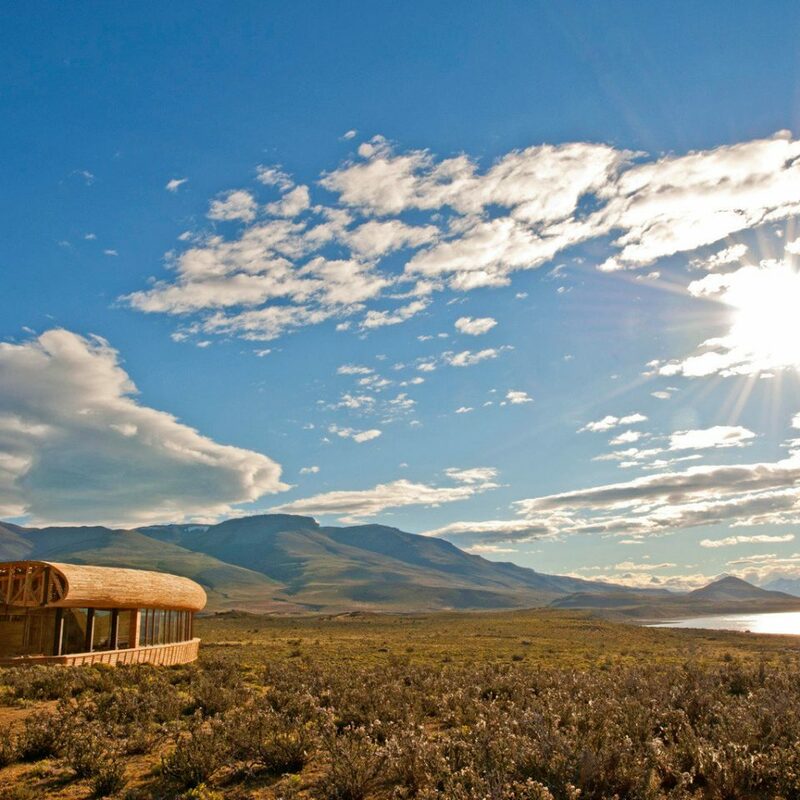 Tierra Patagonia provides everything you need to explore these wilds in comfort and style. 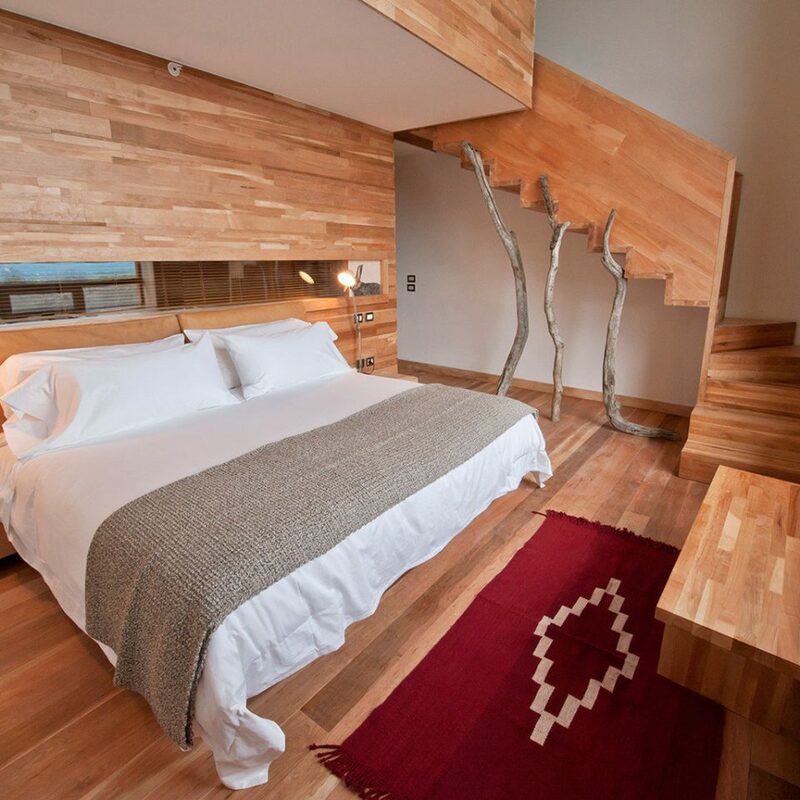 The 40 eco-luxe rooms are built from natural materials (ahem, blonde wood as far as the eye can see) and filled with handcrafted furnishings, like local woolen blankets and antiques. But while each is done up in their own unique touches, all have spectacular views of Lake Sarmiento and the Paine Massif’s jagged peaks. 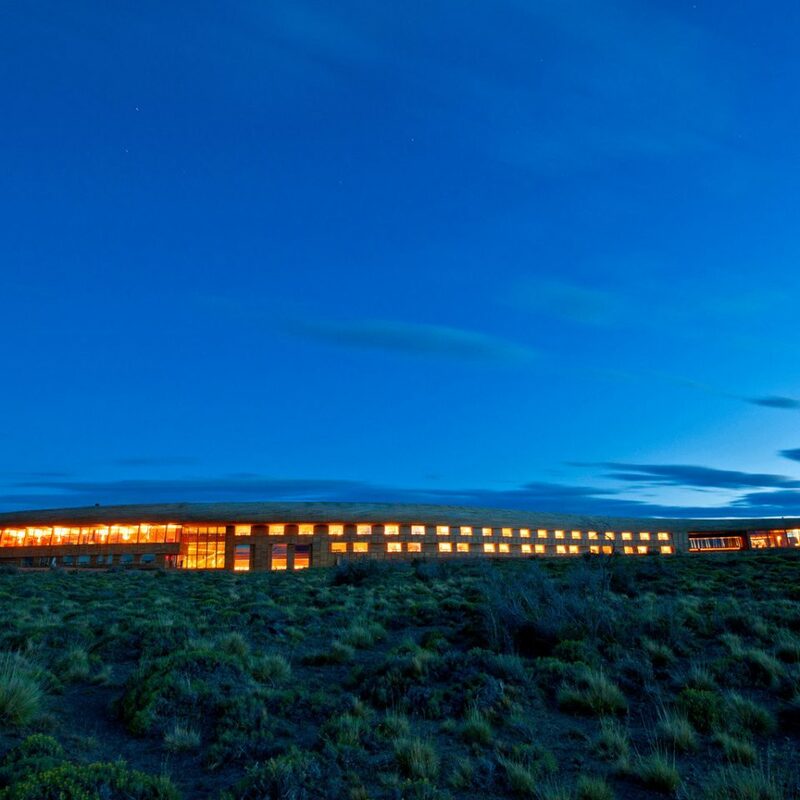 Traditional Patagonian fare and Chile’s best wines is served in the restaurants, but head to Estancia Cerro Guiddo, the hotel’s working ranch, to try the lamb slow-roasted over an open fire. 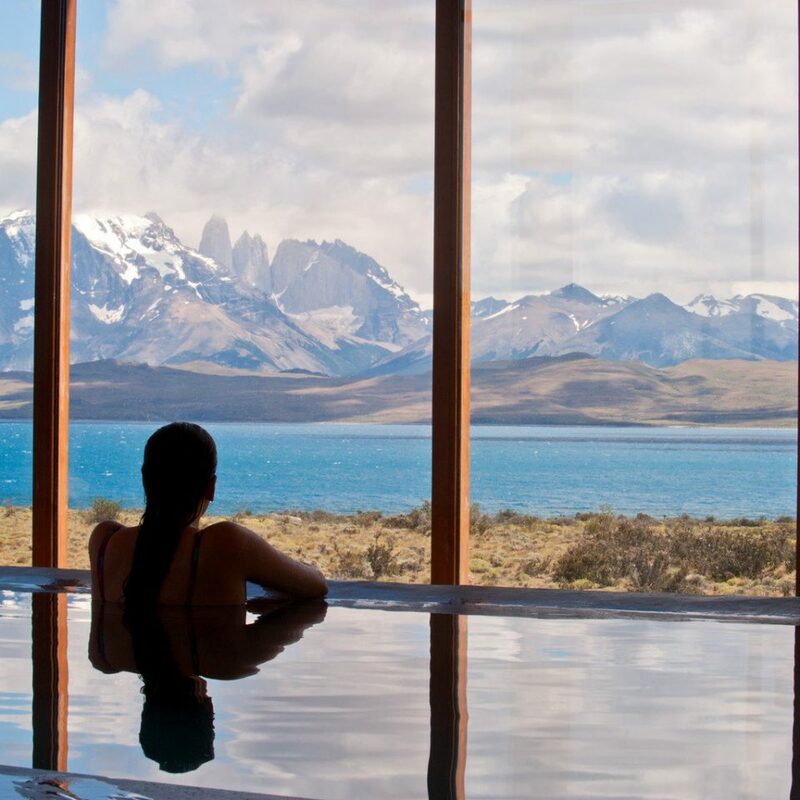 Or, if you’re looking to be pampered, book a day in the large, glass-enclosed Uma Spa, which has a warm lap pool, steam rooms and relaxing treatments, such as the Tierra Patagonia’s signature honey and quartz crystal facial. Afterward, curl up in front of the cozy fire in the lounge with a book chosen from the hotel’s impressive library. Forget what you think you know about vultures: The sight of the Andean Condor — Chile’s national bird — riding the wind currents with its wings fully extended is a highlight of a trip to this part of the world. 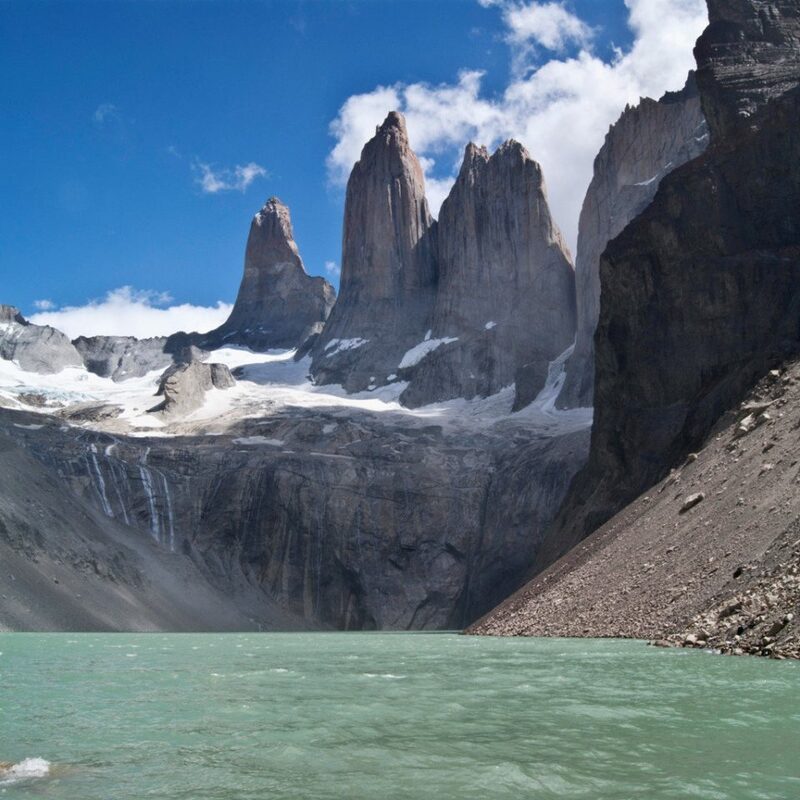 The Andean Condor trek ventures into the heart of Condor country traversing rock buttress for views of the birds along with the Paine Massif, Sierra Contreras, Rio De Las Chinas, Sierra Del Toro and the Sierras del Cazador. Meander along the shores of Lake Sarmiento with an experienced guide to help you identify the wildlife that hides in the thrombolites — striking sedimentary geological formations made of microorganisms — lining the lake. Local gauchos guide the Tierra Patagonia’s horseback trek, starting from the hotel’s working Estancia (Ranch) Cerro Guido. If you’re new to horses, start with the Mirador Bosquecito trip, which winds through a lenga forest towards Sierra Contreras for views of the Sierra del Toro, Lago Toro, Lago Sarmiento, Paine Massif and if the day is clear, you can even see part of the southern ice fields. Just wow. This place is spectacular in every respect. 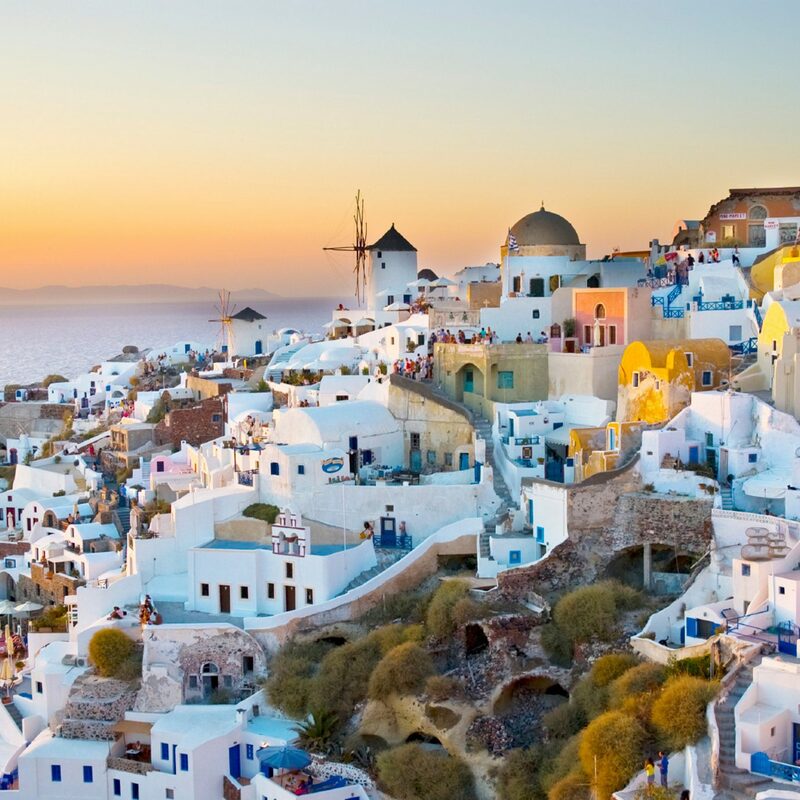 The architecture, scenery, staff, pool, food, and excursions... I honestly don’t see any room for improvement. My husband and I stayed here for 3 nights and I only wish we could have stayed longer because it was absolute bliss. Nicolas manages the hotel and does an outstanding job of making sure everyone is having a good experience. We were very impressed that he greeted and said goodbye to every guest. Every single person we encountered from the excursion planners, waitstaff, guides and cleaners were incredibly friendly and helpful. They offer many full and half day excursions each day with fantastic guides. As we like to hike we spent both of our days on full day hikes to the Base of the Towers and the French Valley. Shoutout to Pipe who gave us a truly unforgettable day out in the French Valley. The landscape is stunningly gorgeous. On or near the property we saw foxes, guanacos, many birds, and 3 pumas! There was no better way to end a big day of hiking than a trip to the pool, hot tub, and sauna/steam room followed by a delicious dinner and multiple glasses of Chilean wine. This hotel is expensive but we felt the price was totally worth it for such an unforgettable experience. We are already trying to figure out when we can come for another visit or try out another Tierra property. Here’s to hoping it’s soon! An all inclusive resort in a beautiful setting with outstanding staff,service and amenities.While the temptation is to enjoy as many of the included excursions/activities for the entirety of your stay I’d recommend spending at least one day just relaxing at the resort.Did the half day mountain bike ride,the blue lake excursion and full day hike to the base of the Towers.Sighted Puma,Andean Condors in flight,Guanaco (everywhere) and lots more.The most expensive 4 days on our 4 week tour to South America (Chile,Argentina and Peru) but truly worth every dollar and cannot wait to go back in future. We could easily have stayed another 6 nights. Easily. The hotel is such an oasis - not just spectacular from an architectural perspective or its stunning setting. The manager and his team are warm and engaging - everyone is ever so friendly, courteous, and helpful. Certainly a very personal touch is applied by all staff. Manager Nicholas is totally hands on, welcoming and farewelling guests personally. 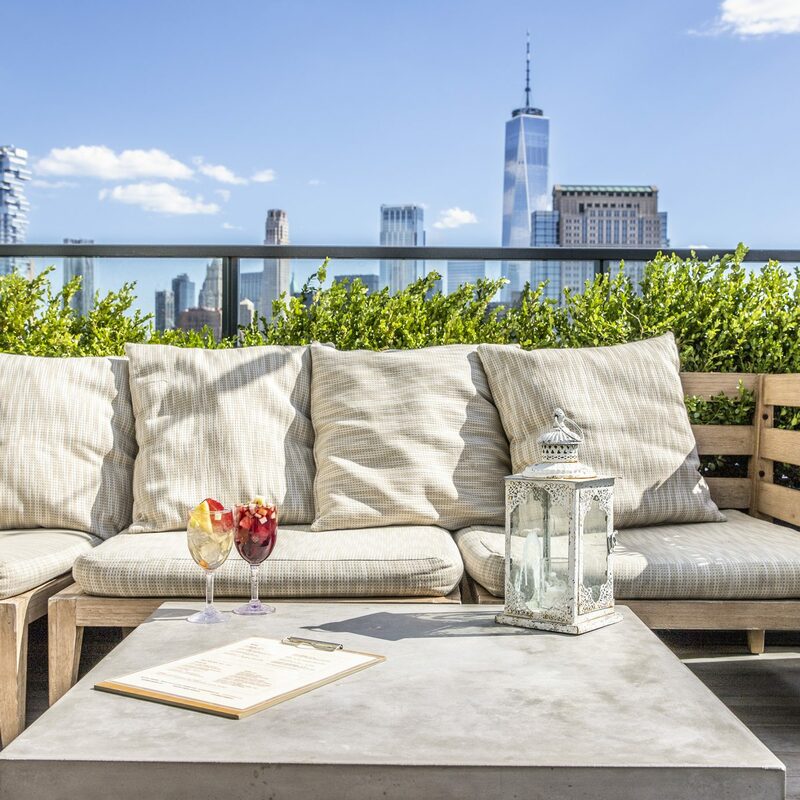 The waitstaff and barmen were perennially the at attention, always observant - ensuring guests are never left wanting. The thoughtful team procured a birthday cake for my wife, so sweet of them. Food was excellent - one of us is vegetarian and certainly we were all well seen to. The homemade ice cream made it to our table for every meal, we could not get enough. We see that some reviewers were not entirely happy with the meals, but we cannot agree - we had no bad meal at all. The lodge is best positioned for puma sightings - we arranged the trip primarily to view pumas and our guide recommended that we stay at Tierra rather than elsewhere in the area. Location is very close to the private farms which allow puma tracking - this is not an activity offered by Tierra - you will have to harness your own puma guide/tracker. We used Untamed Expeditions. The Lodge itself offers an extensive list of walks, treks, horse riding, Kayaking, and other such outdoors activities. Then guests can retreat to the lodge's spa and pool - with an outside hot tub which has an impressive vista over the surrounding mountains. Yoga is offered in the morning and evening. The lodge has a well curated shop - lots of appropriate cold weather gear - and some life-saving Ritter Sport chocolate to consume when you get to the end of your hike! 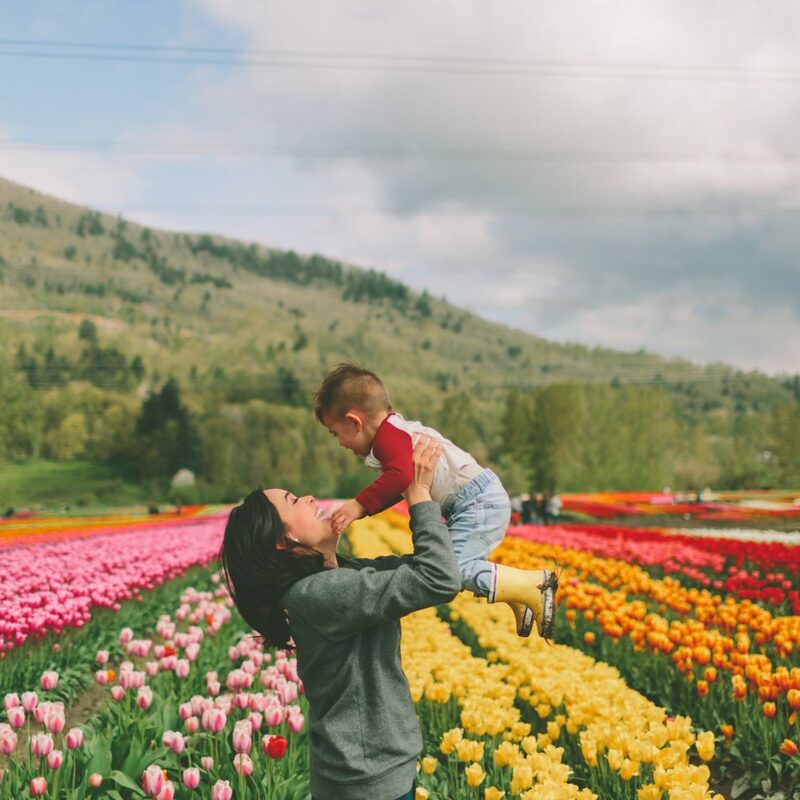 All in all, a truly wonderful experience - we could not have been happier! From the first day we got in touch with the reservation office of Tierra Patagonia to the last day when they hotels' shuttle driver did drop us off again at Punta Arenas Airport after our stay at Tierra Patagonia, all went well, efficiently and smooth. Every employee has been remarkably helpful, friendly and welcoming... making us feel at home. The comfort and architecture of the hotel is outstanding and the internet connection (which was also accessible from our room) was reliable and fast. The food and wine choice are very high standard ... and the roster of excursion sure does give you enough choice on how to keep yourself busy for a day or half a day in regards of your level of fitness and desires (Guides are handy at all the time to help you choose what could fit best your interest ...besides being also extremely knowledgeable, courteous and helpful). It has been an unique and unforgettable experience for my partner and myself and we sure do hope to be able to renew it one day. 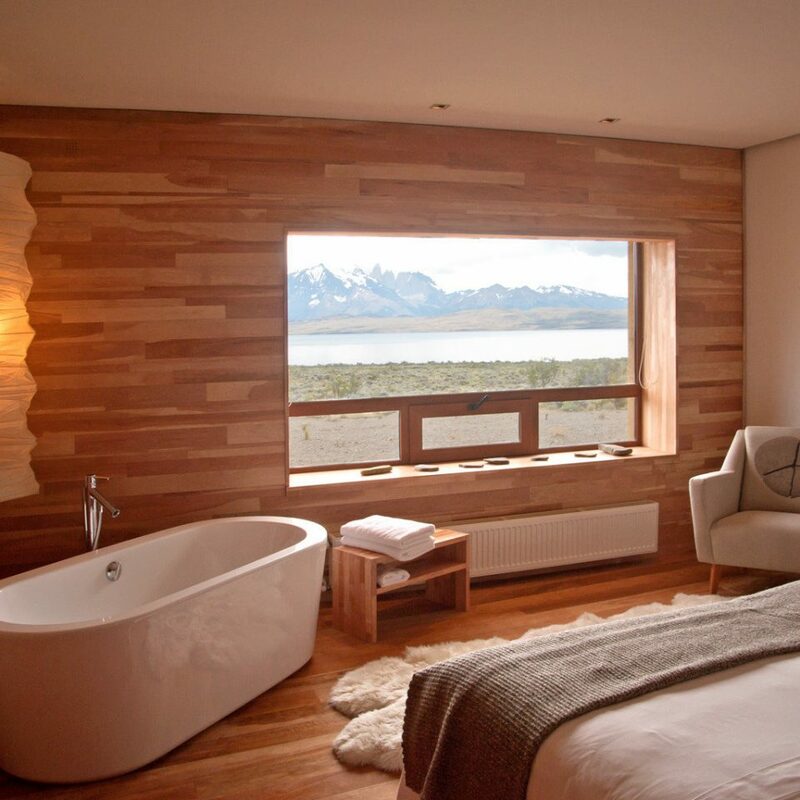 After a long drive from Puento Arenas, you are invigorated by the superb architecture and remarkable views from the lobby. The manager Nicholas keeps an eye on everything. The decor is organic and beautiful. 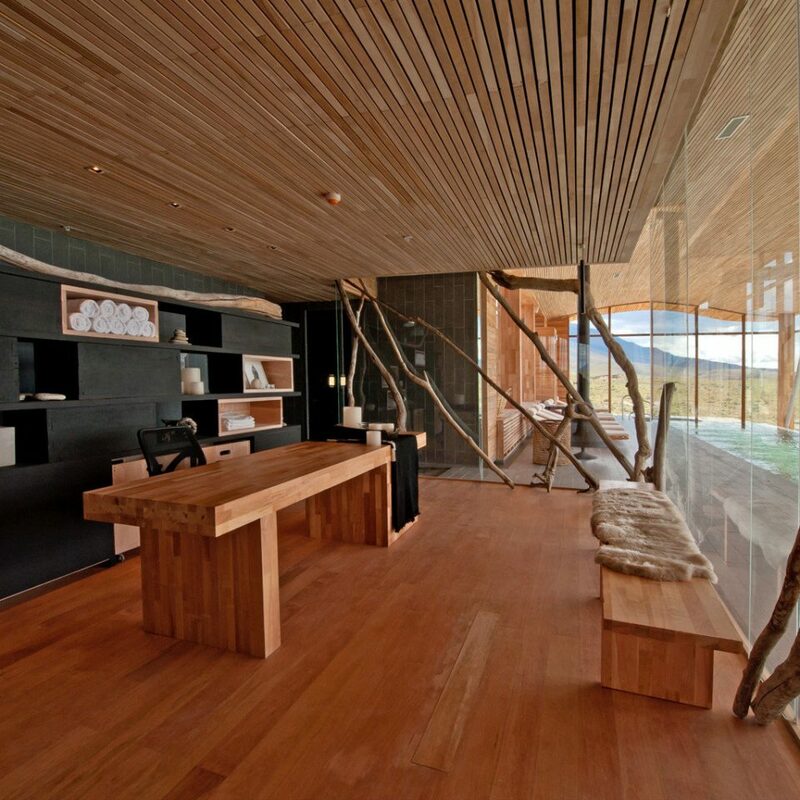 The scale is grand with the windows providing a constant show of changing light playing on the lake and mountains. Many excursions are available, do not miss the Grey Glacier tour by catamaran - full day and well worth the extra charge. Nico is fluent in English, French and Spanish and a delight as a guide. Their drivers are superb, professional and keep safety in mind at all times. Many of the dirt roads are well-maintained, and comfortable to drive over. The spa, pool and hot tub will ease any aches and pains from hiking, horseback riding of mountain biking. Or, just come there to relax.